During March 2006, a probe trench was documented west of et-Taiyiba (Permit No. A-4756*; map ref. NIG 20155–7/68708–10; OIG 15155–7/18708–10; ESI 13:44, 19:33*–34*; HA-ESI 113:43*), when the area was being prepared for construction. The documentation, carried out on behalf of the Antiquities Authority and financed by the landowner, ‘A. ‘Aadal, was performed by D. Masarwa, assisted by N. Zak (drafting). The trench (length 14 m, width 1.22 m; Figs. 1, 2) was located along a steep slope on the northeastern fringes of Khirbat Fardisya. A white plaster floor (L200) above fieldstone bedding was recorded on the northern side of the section. A fieldstone-built wall (W201) that was set on bedrock was discerned near the floor. 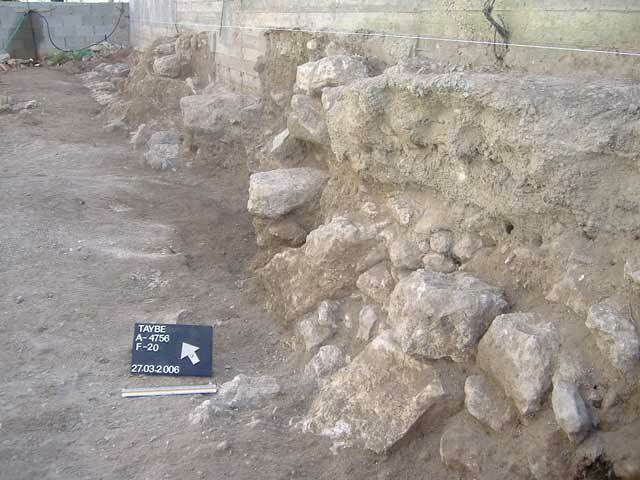 Another fieldstone-built wall (W202) was placed on top of a limestone rock (thickness 0.4–0.8 m). Stone collapse (L203) in the middle of the southern side of the section was cleaned. A modern concrete wall whose construction damaged the ancient remains was built above the trench. Potsherds ranging in date from the Iron Age to the Mamluk period were discovered in the trench. 2. The trench, looking east.